MIT will receive $30 million from Dolby Laboratories, the result of Dolby’s selection as the national standard for digital television audio in the U.S. and a subsequent lawsuit settlement. A crucial vote cast in favor of Dolby by Jae S. Lim ’74, an MIT professor of electrical engineering, helped select Dolby as the standard for digital television audio in the United States. Lim cast MIT’s 1993 vote in favor of Dolby’s technology in the television industry “Grand Alliance” to draft a unified recommendation to the Federal Communications Commission. He is expected to receive more than $8 million from Dolby’s payments to MIT, said Jack Turner, the associate director of the Technology Licensing Office. The settlement of a lawsuit over an MIT-Dolby royalty sharing agreement under which Dolby was slated to pay MIT if either’s audio system proposal were accepted -- that is, if Philips Electronics’ competing “Musicam” system were rejected -- placed Lim in the unusual position of receiving millions of dollars from Dolby partly as the result of having voted in favor of Dolby’s system, over Musicam and MIT’s own system, on a technical advisory committee to draft the industry’s unified recommendation as part of a government-run national standardization process. MIT was one of four votes on the Grand Alliance Technical Oversight Group, charged “to pick the best technical solution for the Grand Alliance system.” Dolby did not have a vote and was not a member of the committee, although its audio system was under consideration for selection. In what MIT spokesman Kenneth D. Campbell later characterized as MIT’s official comment, Professor Alice P. Gast, the vice president for research, said Lim and MIT’s financial stake in the outcome of the Grand Alliance process did not influence the government’s standardization of digital television. Peter Fannon, then the director of the FCC’s Advanced Television Test Center, echoed her remarks. “It made no difference to the [FCC television committee] what individual business deals these guys made,” he said, because the FCC later evaluated the Grand Alliance’s proposal to make sure it was acceptable as the national standard and at least as good as what each individual Alliance member had previously proposed. Lim declined to comment for this article. Other members of the Grand Alliance cited the Dolby system’s American roots and its technical superiority over Musicam, not MIT’s financial interest in Musicam’s rejection, as the likely reasons for Lim’s vote. Philips’ Musicam system, also known as “MPEG,” is related to the technology used in MP3 audio compression, and is the standard for digital television audio in Europe. “Jae Lim, independently of any deal, did not want the Philips system to win,” said Robert Rast, the leader of the Grand Alliance’s Technical Oversight Group, and then a vice president of a firm that was both an MIT partner and competitor, General Instrument Corp. When in court for the MIT-Dolby lawsuit, Lim said that he voted in part to protect MIT’s interests. “I did not believe that the Dolby system was technically superior to the MIT system,” Lim wrote in a court filing. “I voted for the Dolby system to ensure that either the MIT system or the Dolby system would be selected as the winning audio system,” he wrote. Before voting for Dolby in the Grand Alliance, Lim said he called a Dolby employee, Craig Todd, to confirm details of MIT’s agreement with Dolby. “Based on technical merits, MIT could vote for the MIT system and MIT could also vote for the Dolby system,” Lim said in court. “In the event that I do vote for Dolby, I wanted to make sure that MIT’s financial interest is covered,” Lim said. Senior Lecturer John Preston, then the director of the TLO and a co-representative to the Grand Alliance with Lim, said financial concerns had nothing to do with MIT’s vote. “There were lots of ways to make money, and we weren’t interested in that,” Preston said. Because of the potential for a conflict of interest, Turner said, the matter would likely have been discussed with MIT’s vice president for research, which was then Professor J. David Litster. But Litster said he did not recall the matter of MIT’s Dolby relationship coming to his attention. “If the others didn’t know about MIT’s situation with respect to Dolby, and it’s certainly possible they didn’t, because I don’t think I knew about it, that might not have been such a good idea,” he said. “The real solution is complete and open disclosure so everyone knows what’s going on,” Litster said. Indeed, Preston said that MIT made such disclosure to its Grand Alliance partners. “AT&T, Thomson, Philips, Sarnoff [and Zenith] knew before any vote was taken on the audio system,” he said, referring to other members of the Grand Alliance. However, there was some disagreement among former members of the Grand Alliance on this point. “I think the other members [of the Alliance] would have been quite upset” if they had known about such an agreement, said Joel Brinkley, the author of Defining Vision, a comprehensive account of the HDTV standardization process, and a reporter for The New York Times. “I was not aware of it, and I was speaking to all of them,” he said. “Many millions of dollars were at stake. The contract for Dolby was one of the best things ever to happen to that company. They are now the audio system for every television that will ever be sold,” he said. Representatives of both of MIT’s competitors on the Grand Alliance -- a team of Zenith Electronics and AT&T, and another team of Philips, Sarnoff Corp. and Thomson Multimedia -- said they did not recall hearing of the MIT-Dolby relationship, which they would have learned of almost 10 years ago. Rast said he, as a representative of General Instrument, which had proposed Dolby audio to the government, had helped cause MIT and Dolby to make their agreement. “It was not public knowledge at the time that I was pushing behind the scenes for a deal,” he said. “In anticipation of the [Grand Alliance] merger, I had counted noses and realized that we would need MIT’s vote in order for Dolby to win,” Rast said. “So I encouraged the Dolby people to make a deal with MIT” to join forces, with Dolby paying MIT to increase the chances of Dolby winning over Musicam, he said. Dolby’s payments are the result of a last-minute settlement in April of a lawsuit MIT filed against Dolby in 1997, concerning a dispute over their royalty-sharing agreement. Despite Dolby’s selection as the national standard, Dolby never paid MIT its royalties, citing an ambiguous termination provision of their contract. 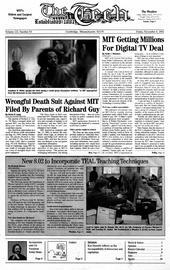 In 1997, MIT sued Dolby in federal district court in Boston as a result. After a six-day trial, the jury deliberated and reached a unanimous verdict in favor of MIT, a juror said, but the verdict was never read in court: MIT and Dolby had reached a last-minute settlement. “[Lim] aroused our sympathy, but he obviously blew it, or else [MIT’s] attorney blew it,” negotiating the contract, said the juror, speaking on condition of anonymity. The Tech recently learned details of the settlement, which MIT and Dolby had declined to disclose, and Turner, TLO associate director, confirmed that Dolby will pay MIT $30 million over the next ten years. As part of MIT’s policy on technology licensing revenue, Lim, the sole inventor of the technology covered by the MIT-Dolby agreement, will likely receive over a quarter of the Dolby payments, Turner said. Provost Robert A. Brown is still deciding how to distribute the remainder of Dolby’s payments to MIT, Turner said. Dolby’s selection came after it offered another of the four voting members of the Alliance’s Technical Oversight Group, Zenith Electronics Corp., a 25 percent discount on patent royalties in exchange for Zenith’s vote, said Craig Todd, a senior member of Dolby’s technical staff, in a deposition in the suit. Zenith subsequently changed its vote on the Oversight Group to be in favor of Dolby, but it is unclear whether Zenith accepted Dolby’s offer of a royalty discount. If so, it would mean that half of the voting members, MIT and Zenith, of the Grand Alliance were receiving monetary compensation from Dolby as a partial result of their vote for Dolby. Zenith and Dolby declined to comment on the matter.